How do I introduce Strategic Living? For the past few weeks I have been giving this some thought on a macro level, for although I would love to start by launching a series of detailed articles on components of what I like to call strategic living, that seems a bit backward to me. Instead, for the third time in five years, I have redefined the steps needed in order to live a strategic life. Although these steps are tied to personal goals, they are none-the-less universal. Some represent a reaffirmation of the old and some are new. They are all important and today I share them with you. 1. Define the word “comfort” in your own terms and surround yourself with whatever it takes to fulfill that definition. Comfort can mean many things depending upon time and circumstance. My definition includes a warm home and a full belly. It also means a life with lots of hugs and without an iota of loneliness. Being a homemaker does not mean being a drudge. Drop those old-time definitions from the 40s and 50s and become a modern homemaker. Cook, do laundry, and maintain a clean, and hopefully chemical-free home. What I am learning is that there is no longer a stigma attached to being proud of my home life. Perhaps it is my age, but I would like to believe that having pride in maintaining a tidy, clutter-free, and inviting home is a sign of being well-grounded and happy with life as we know it. Natural remedies can take many forms: herbs, spices, plant roots, essential oils, teas, , salts, and various food products. There are hundreds of natural remedies and it is up to you to experiment using them so you know what works and what doesn’t. One size does not fit all. Note: I always recommend that you do this in partnership with an understanding physician who has your best interests in mind. Even during busy times, it is not difficult to quickly prepare a meal consisting of real food products. These products don’t necessarily have to be fresh, but they should not include a chemical cocktail of preservatives. 5. Take time out every day for yourself to pursue hobbies that fulfill your need to relax and to be creative. Hobbies are like a rabbit hole that we can descend into for a short respite from the stresses of the day. They do not have to be expensive but they do have to be enjoyable. When they cease to give you pleasure, it is time to move on. One more thing: one person’s hobby is another person’s chore. Just because you love doing something, be it a group activity, or a solitary activity, does not mean your partner or family has to participate. I learned this the hard way. When is the last time you laughed? While compiling this list I had to ask myself that because honestly, I could not remember. 7. Exercise your body and mind by walking, reading, and opening your mind to new ways of thinking about life. Almost everyone I know is stressed-out these days. Those that work outside the home are putting in long hours, leaving home before dark and coming home after dark. Those that work from home are often always on call, with work related texts and emails seducing them at all hours of the day and night. For a brief period each day, shut down the smart phone, the iPad, and the laptop. Step away and breath some fresh air. Bundle up if you have to, then stand on the porch or take a walk so that you can take in the universe. Think about yourself, your life, and your loved ones. This is closely related to #7 but different enough and important enough to include it as a separate item. Something I have learned these past six years is that time is not necessarily kind to our brains. It takes longer to think through the answer to complex calculations and remembering some quote from just a few years back becomes difficult. To reconnect the brain cells, try putting aside the iPad or computer and doing something the old fashioned way, whether that means reading a physical book, completing a Sudoku, or putting together a jigsaw puzzle. Even playing scrabble or another thinking type board game will exercise those brain cells. Forward thinking is a business term having to do with the avoidance of pitfalls and failure. Applying that concept to daily life is easy: become a MacGyver. If the tools you need to accomplish a task are not readily available, get it done anyway using creativity and innovation. Creativity and innovation do not add up to rocket science. They equate figuring out what needs to be done then doing it, using resources on hand. This ties closely with having optimism for the future. Who hasn’t suffered from boredom when all they can see ahead of them is the daily grind, over and over again. Find something to look forward, set you goal along a timeline, then takes steps to make it happen. What’s New and What’s Different? If I have held your attention you have read this far, you may be scratching your head and saying to yourself “but what about the “10 Steps to Living a Strategic Life” you have written about previously? There is definitely some overlap but there are also some differences. What I have written about before on the Backdoor Survival website and in my eBook (co-authored with George Ure) were prepper-centric. What I write about here is broader and transcends being prepared for disruptive events. The “strategic life” I describe here is a blueprint for living day to day with no agenda. This is the here and now, resolutions if you want to call them that. At this time next year, the steps may change. Furthermore, your steps may be different than mine. If you are thinking the same thing, then you are on the right track. We all need to define our lives in our own terms. The common denominators are most likely comfort, wellness, and an entertaining spirit. And with that, let us go forward and live strategically! In this section, I will feature a handful of some of my favorite things. These are items I have purchased and used in my own pursuit of a strategic life. While there are no “new” ideas here this is a timely reminder, much needed. Those of us with the responsibility of others weighing on us often let ourselves get lost in the shuffle. I’m going to save this & read it at least once a week. Thanks. Gaye, Thank you for this beautiful, insightful, post! It’s been twenty years since I bought a country homestead property and spent most of my time trying to achieve what you describe. Initially it was all do, do, do, achieve, achieve, achieve, but finally I realized I could never get it all done anyway and shifted to trying to have a happy, balanced life. I’m so excited about your new site. Thank you!!! As part of staying balanced, my goal with Strategic Living is not to create an accidental business. This is something I am doing simply for the joy of it. Thank you for joining me on this journey. #10 is at the top of my list. I always am planning things to look forward to as my reward for finished projects. Usually, my reward is to read a part of a novel without feeling guilty about taking time to read for pleasure.The biggest reward I’ve given myself was to find out my ancestry compilation at 23andMe. It was so interesting. I love to laugh. Hubby and I have downtime in front of Netflix (or TV shows) every single day. Call us names and toss stones, if you must, but we are avid TV watchers. Shows help us unwind, decompress, and zone out. Some of our favorites that generate belly laughs are: Frazier, Last Man Standing, Kevin Can Wait, The Middle. I personally love Monsters, Inc (I know….it’s for kids….but the catchy lines…..killer!) and any Pixar movie, really. We watch plenty of “other” shows, too, with little to no comic relief…..but, our favorites are those that make us laugh out loud….and loud we can be! Great article, Gaye. Great new website! I asked what that was, and he said someone who cares about home and neighborhood. 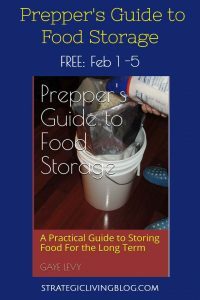 I am definitely still prepping but after the big move, my perspective has changed in many areas, especially with regard to food storage. Imagine that. Less canned goods and packaged goods and more FD meal pouches are, for me, the way to go. Plus beans and rice, of course.